The Universal Juicebox is a custom power supply manufactured by Frezzi Electronics. 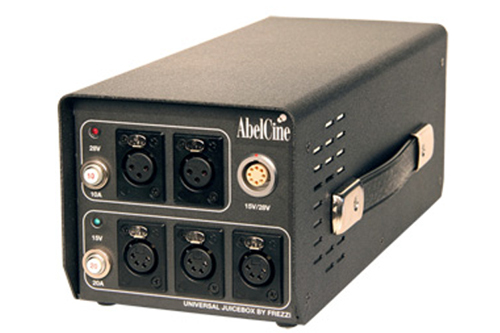 The Universal Juicebox is the most powerful and versatile AC power supply in the industry. It delivers both 14.4v and 28v simultaneously. It has six power outputs that are all powered at all times. The Universal Juicebox can continuously output in excess of 600w of power (300w of each voltage), making it ideal for use with a variety of cameras, i.e Alexa, Sony F65, monitors, lights and other equipment.